Week Plan gives the control of your recurring tasks in your hand. 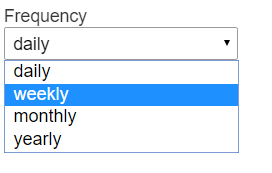 Set a task that repeats daily, weekly, monthly or yearly. 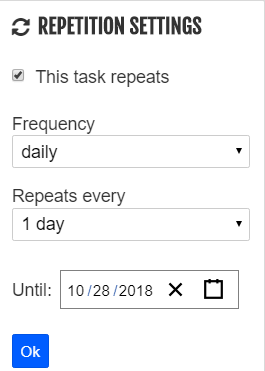 Quickly set up the frequency of how often you want a task to be repeated across multiple weeks. Want to close a recurring task in an advanced date in future? 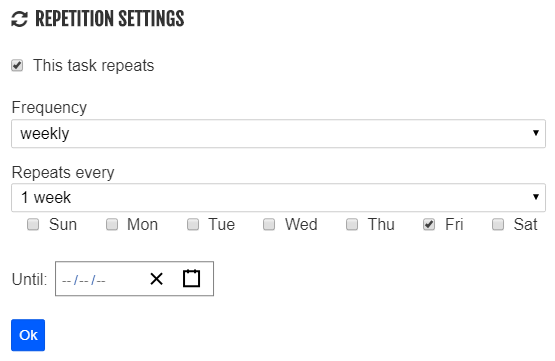 Configure an end date with a task in future, and it will stop recurring whenever you want it to be. You don’t need to ask your team and task progress every week. Automatically inform and get a status update at time and date you set. Working with dispersed and remote teams can be complex and challenging. Automatically organize weekly recurring standups with your team, regardless of their time zone.